A seven-year-old girl accused of witchcraft, confined and tortured by her father has been rescued at Akyease Wansamire, near Asuofua in the Ashanti Region of Ghana. The girl's body show visible marks of pain inflicted on her by her 34-year-old father for over a month of confinement and physical abuse. 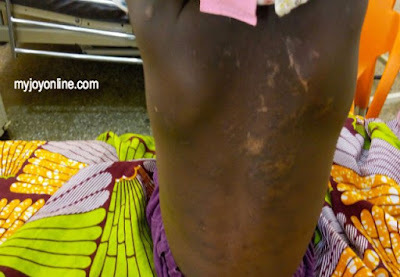 In a frail body and looking too small for her age, the doctors tell Luv News' Erastus Asare Donkor X-ray result shows multiple fractures on her left leg and arm, believed to be the result of beatings. The frail looking limping girl's back, hands and face have a cluster of cane marks. Her abusive father, Kwabena Yeboah, is in police grips following a report by Suntreso Hospital officials after the culprit’s fiancée had sneaked the child out to the hospital for medical attention. She told Luv News the pain she has suffered at the hands of her father. The seven-year-old said her father burnt her fingers with fire, stepped on her leg and it broke, beat her with a stick, refused to take her to school and denied her food. Mr Yeboah's fiancé said she had to save the girl because her (the girl's) ordeal was becoming unbearable. "He branded the girl a witch and he sees four spiritual objects in the girl's body when she sleeps. During those times, he would persistently hit the girls stomach until she faints. He torched her fingers for stealing meat from the soup and threaten to burn her alive at the end of this month (July)," the fiancé said. The paediatrician at the Suntreso Government Hospital, Dr Ashura Bakari says the girl's fracture requires surgery to correct. "The child has multiple body wounds; some healed and some of them are new especially on the hands. She has swollen fingers and sceptic wounds - infected wounds around the knuckle," she said. Bakari said the wounds deteriorating with smells from the wounds and "burn scars at the back, the arm and the two bones in the legs are fractured." She said a specialist surgeon at the Komfo Anokye Teaching Hospital has been called on to help with the girls condition. The Social Welfare Department is in the process of securing a new home for the traumatised child. A Social Development Officer in charge of the case, Godfred Adogo says they are "looking at how to help the child, she is psychologically traumatised and needs to be removed from the place where the trauma took place."